You should know about my new found love for frozen drinks by now. After a quick dinner at Brown’s Chicken & Pasta, I had a decision to make. I could either go back to J’s parents for an hour or so and risk either falling asleep or getting involved in a Wii game and miss the party or I could just kill time shopping or something. I chose shopping. I only know two ways to get to the Chicago Ridge mall. One is to take the busy Central Avenue to 95h or to take the even busier Cicero Avenue to 95th. J and her family weave through the neighborhoods, but I’m not brave enough to drive and find that way on my own, so I chose Central to 95th. I figured along the way, if I saw a Speedway or 7-Eleven I was going to stop for a Frozen Coke/Slurpee. As I turned from 103rd to Central, I noticed a 7-Eleven in the strip mall on the corner, so I made a quick lane change and went after my Coke. Normally, I wouldn’t blog about every 7-Eleven I stop at. 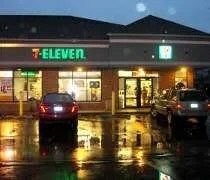 You all know by now what the store’s all about and you really have even less interest in a Chicago convenience store than you do a Chicago restaurant, but it’s not the Slurpee’s that make this 7-Eleven stand out. I I got my Coke slurpee as usual and made my way to check out. It was here that I noticed something different. Near the counter, they actually had a deli. Yes, a real deli. Not just some pre-made sandwiches, but they had a meat case and a slicer. I was actually a little impressed. I stood there with my Slurpee eyeing the meet when the cashier came over and asked if I wanted anything. I was really tempted to get some roast beef just out of curiosity, but I saved beer money knowing I would need it later that night. I’ve been in a number of 7-Eleven stores and that’s the first one I have seen with the deli. The rest of the store was pretty much typical for 7-Eleven, but the meat case really made it stand out as something different.